Rapid high early strength cement-based pre-packed concrete for thick section placing where rapid early strength gain is requried. May be placed at temperature down to 5oC. Road opening can be achieved in one hour under normal conditions. Applications include installation of road furniture, barriers and stanchion posts. 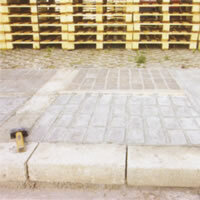 Rapid setting concrete suitable for rapid reinstatement of road and street furniture. Single pack mix with low on-site water requirement making it ideal for use by mobile repair teams. Suitable for all general permanent reinstatement works where ultimate medium or high strengths are required. 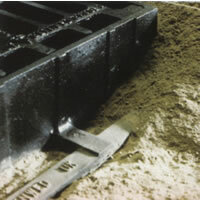 Incorporatesgraded aggregates and special non-shrink additives. Hardening in five minutes, initial set in approximately 10 minutes dependent on conditions. Can be placed up to 500mm depth in a single pass. Polyester resin based ultra rapid setting grount formulated to flow into gaps and voids under frames being installed on roadways and highways. Ultra rapid setting to allow road opening in minimum possible time. Available in summer and winter grades. Used for rebedding of existing frames, setting of new frames and grouting of other road furniture and ironwork. Typical curing time just 18 - 22 minutes in normal conditions. 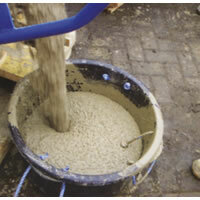 Rapid setting concrete suitable for rapid reinstatement of road and street furniture. Single pack mix with low on-site water requirement making it ideal for use by mobile repair teams. Suitable for all general permanent reinstatement workswhere ultimate medium or high strengths are required. Incorporatesgraded aggregates and special non-shrink additives. Hardening in five minutes, initial set in approximately 10 minutes dependent on conditions. 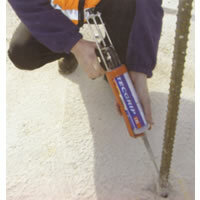 Can be placed up to 500mm depth in a single pass. Premium Grade bedding Mortar suitable for bedding manholes and fixing road furniture at ambient temperatures down to +1oC, Hardens within ten minutes to allow continuation work. Road opening within one hourin normal temperatures and conditions. Road opening possible in 3-4 hours at +1oC. 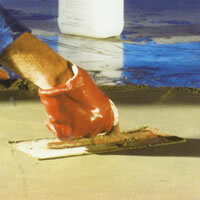 Supplied in bags or tubs and suitable for hand mxing. 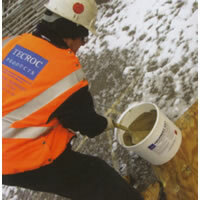 Pre-mixed cement based non-shrink bedding mortar. Suitable for the support of road ironwork and highway furniture. Mortar will harden in approximately 10 minutes, reaching 20N/mm within 45 minutes allowing early opening of roads to veicular traffic. Suitable for bedding and rebedding of roads frames and fixing of street furniture at ambient temperatures down to +1oC. Single pack mix, requires only addition of water. 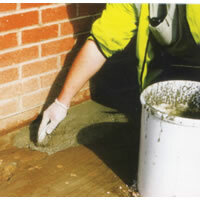 Can be placed at thicknesses up to 75mm or greater when applied in layers with added pea shingle. 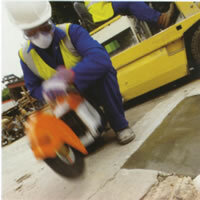 High early strength cement-based bedding manholes and fixing road furniture. Road opening normally within 45 minutes. Specification data to BBA certificate. Fast setting patch and repair material designed for quick setting patch repairs to highways, kerbs and concrete paths, allowing opening to foot traffic in one hour andvehicular traffic in four hours. 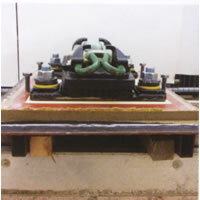 A two component mix incorporating a co-polymer latex gauging liquid. produces a fairfaced finish and has a working time of approximately20 minutes. Chloride free making it suitable for the protection of exposed reinforcing steel. rapid setting ensures earliest opening of roads with new kerbs. High adhesion enabling permanent impact-resistant bond, with curing at temperatures down to 0oC. Available in summer and winter grades. anchoring applications including dowels, studding, starter bars, brackets, etc. Settingtime 5 minutes at 20oC (15-20 minutes for tropical grade).